To take part in EY Business Game Competition 2016 you must register and complete Skillgame. You can participate in a team with colleagues from your own university! In order to participate in the competition you need to register and complete Skillgame. Each participant must be part of a team, by inviting colleagues from your own university, or by joining an already existing team. Each participant registering at Skillgame must invite a minimum of 2 to a maximum of 4 colleagues of the University, or join an already established team, which will consist of a minimum of 3 to a maximum of 5 participants. Skillgame is an online test which consists of 24 multiple choice questions on four thematic areas: Emerging Technologies, Business Keywords, Logical Thinking, Business Planning. The questions have different levels of complexity and each question is assigned a specific score. The maximum score is 48. Skillgame must be carried out by a group: when all the members (or at least 2) of the team have confirmed their participation, the leader will have access to the test, which will be done by the whole group. The first 240 teams classified at Skillgame are called to participate in the Business Game competition! The ranking of Skillgame is unique for Italy and Spain: the first 240 teams classified for Skillgame can participate in the Business Game competition. Teams will compete online with the aim of becoming the market leader. Teams will be contacted via email and the list will be published on the website in the Business Game section. All participants are asked to send their CV, as follows: the Italian participants, should upload their CV on the site www.ey.com/it/careers by applying at EY Business Game 2016. Spanish students, will be able to send their CV by sending an email to eytalent@es.ey.com In addition, the leader of each team will have to upload a picture of their team. 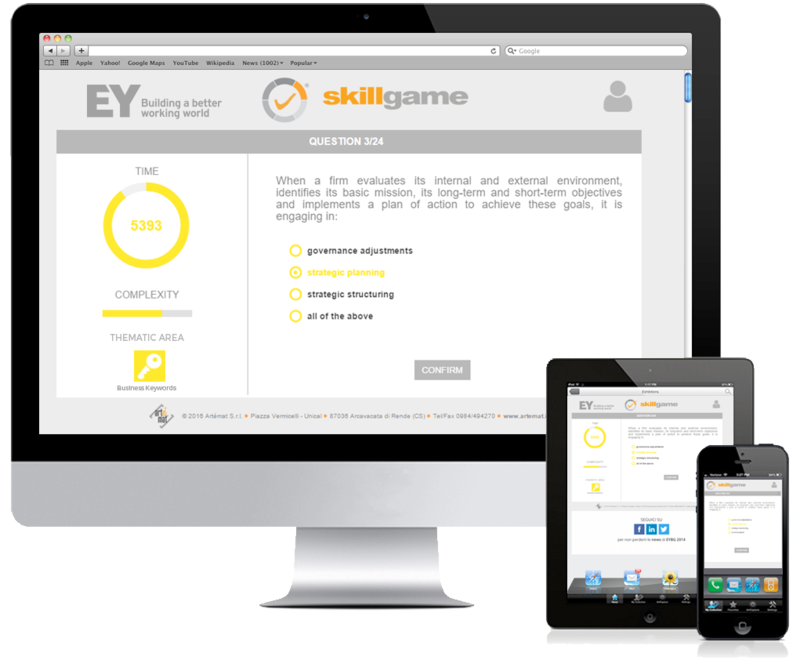 Skillgame, the web based assessment system. Skillgame enables a simple and fast evaluation of the candidate's knowledge on on specific thematic areas which are company/business oriented. At the end of the test, the candidate can view the ranking of a single thematic area or the total ranking.